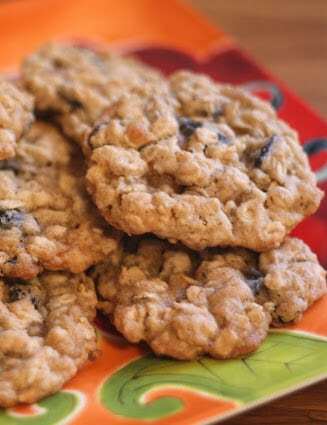 Soft and chewy oatmeal cookies filled with the perfect amount of raisins are one of my all time favorite cookies. I’ve been making this recipe for years and it’s one of the most popular cookie recipes I make. The dough freezes well, as do the cookies, so I frequently double or triple the recipe to have it on hand all the time. I was sick over the holidays this year and I was craving oatmeal cookies, but I didn’t have any in the freezer. Sean made these for me and they turned out perfectly. 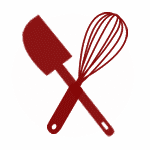 (Baking is not his thing at all, so having an easy and reliable recipe helps!) I even hid a few in the freezer, just for snacking on with my coffee over the next week. Kitchen Tip: I use this bowl, this sheet pan, and this cookie scoop to make this recipe. Preheat oven to 350 degrees. In a large bowl, beat the butter until smooth and almost fluffy, about 2 minutes. Add the sugars and continue beating until the mixture is light and fluffy, about 4-5 minutes. Add the eggs and vanilla and beat until smooth again. In a separate bowl, whisk together all of the dry ingredients except the raisins. Gradually add this mixture to the wet ingredients, half at a time. Stir until fully combined. Add the raisins and stir well. Using a medium size scoop or a rounded tablespoon, drop the dough onto a large baking sheet lined with parchment paper or a silicone mat. Bake for 8-9 minutes. Remove from the oven before the cookies are browned and when they still look soft in the center. Let them cool on the same tray for 5-10 minutes; this will allow them to finish baking without overcooking. Enjoy! What a nice guy to make you cookies! 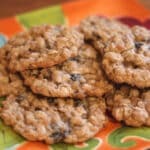 They look amazing...I LOVE oatmeal raisin cookies! So good! What a nice man you have. The cookies look delicious. Oatmeal cookies always make me feel better! Hope you're fully recovered. Aww, what a nice hubby to make you cookies. And these look so good. I love oatmeal cookies! Hope you are feeling better...I have had a sinus infection this week and it's not fun being sick. I make them with craisins all the time. I like them both ways! Heading to my kitchen to make them now. My favourite too. These are the only cookies I ever eat. Your's look yummy. Just love this recipe. I just made these wonderful cookies and I love this recipe. Thanks for the Tip on taking them out early. I have often wondered why my cookies always look like they are about to burn.Thank you again. I have made these cookies twice in the last 2 weeks, my family loves them even the ones who don't like raisins. I will be baking another batch this weekend. Taking them out early is definitely key to the perfect cookie. Thanks for a fantastic recipe. 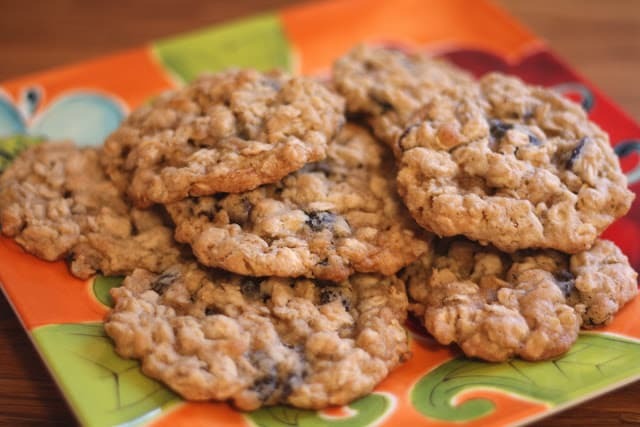 These are now my absolutely favorite oatmeal cookies! Didn't have raisins so I used craisins. They provided that same subtle sweetness that raisins do. After the first batch I learned to get them out of the oven at 9 minutes exactly even though they still looked quite raw. Once they cooled a few minutes they had that "just right" chewiness to them. If you bake them longer they are still delicious if you want that crispiness minus the chewiness. I went ahead and rolled the remaining dough into small balls and froze them. A small ice cream scoop is great for portioning them. Hi. About how many cookies does this recipe make? If I recall correctly, it makes about 30 cookies. I'll make a note of the results next time I make the cookies. Thanks!